Vice president Yemi Osibanjo has called for a review of the reward system for Nigerian journalists so as to enable them to do their jobs with integrity. InoutNaija understands that Osinbajo who was speaking during an Editorial Conference on Legal and Ethical Issues in Investigative Reporting in Nigeria, organised by the Daily Trust Foundation in conjunction with MacArthur Foundation and Center for Media Law and Development yesterday, stated that when the reward system is low, it will remain wishful thinking for journalists to perform their duties with integrity. Osinbajo who was represented by his Senior Special Adviser on Media and Publicity, Mr. Laolu Akande, however, urged the Nigerian media to continue to hold the government accountable through investigative journalism. He added that with the roles and functions of the media, it was a veritable avenue to keep the government alive to its responsibility to the people. 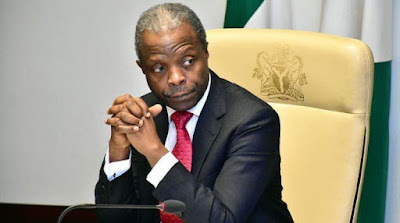 Osinbajo added that self-regulation is the best mode of regulating the media and noted that only self-regulation will aid the media practitioners to check fake news in the country. He expressed sadness that most Nigerian journalists have abandoned investigative journalism, adding that the lack of investigation, has also increased the rate of fake news in the country. Also speaking, the chairman, Daily Trust Foundation, Mallam Wada Maida called on the media to always abide by the roles as entrenched in the constitution while ensuring accountability of public officers for the growth and development of the country. In his remark, director (Africa), MacArthur Foundation, Dr Kole Shettima, said the organisation was delighted to work with media organisations in Nigeria on the critical issues of investigative journalism, stating that the company sees it as a core part of the work that it had set out to undertake. In his presentation, the Senior Advocate of Nigeria, Femi Falana urged the media to make use of the Freedom of Information Act to investigate issues, especially in the government adding that public officers who failed to comply with providing information can be charge for violation. The conference was also attended by the Director-General of the Voice of Nigeria, VON, Mr Osita Okechukwu and the DG of Broadcasting Organisation of Nigeria, BON, Godfrey Ohuabunwa.